Carlos was born in 1971 in Vigo, the port that connects Galicia to the world. “Galicia,” Carlos says, “is the magical part of Spain.” His music draws on influences that range from ancient and contemporary Celtic to medieval and baroque, and also borrows from the sounds and styles of the places where Galicians have settled, including Cuba, Brazil, and Argentina. 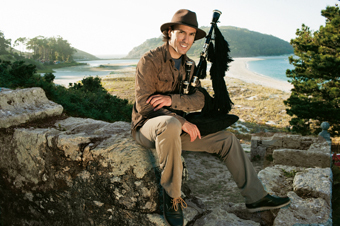 His album, Discover, features such diverse guest artists as the Chieftains, Jackson Browne, Los Lobos, Sinéad O’Connor, Laurie Anderson, Hector Zazou, Ryichi Sakamoto, Scottish accordionist Phil Cunningham, flamenco guitarist Vicente Amigo, Brazilian star Carlinhos Brown, Spanish soprano Montserrat Caballé, and Buena Vista Social Club members Omara Portuondo, Compay Segundo, and Cachaíto. For an evening of far-flung music with deep Celtic roots, don’t miss Carlos Núñez at the Freight.